PERSONNEL OF THE ORGANIZATION. 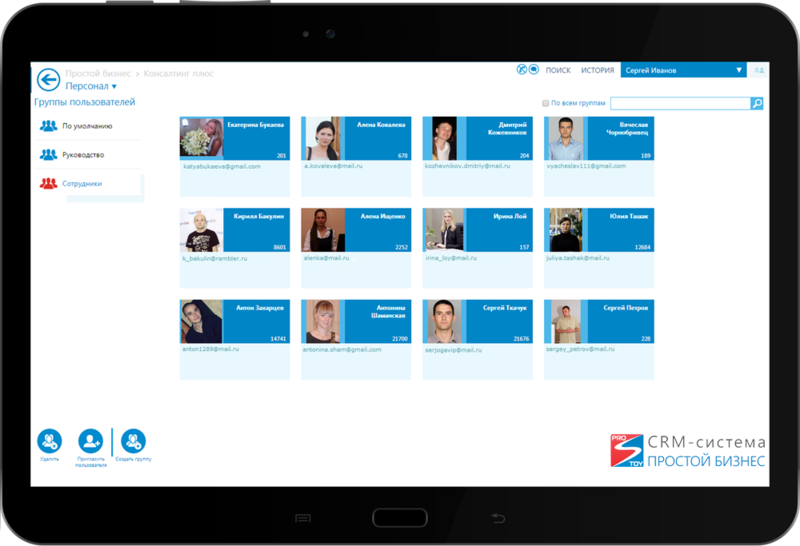 MANAGEMENT OF STAFF AND REMOTE EMPLOYEES IN THE CRM SYSTEM "PROSTOY BUSINESS"
CRM-system "Prostoy Business" will help you organize effective management of regular and remote employees. Invite your employees to the system, and let each of them fill out their questionnaire. Form the organizational structure of the company, assign tasks to the entire organization, department or one employee. See how much time each employee spends on doing the job. Alert the personnel in the program or by SMS on important matters. Create a knowledge base for storing answers to frequently asked questions, scripts, documents - this will increase the speed of training for new employees and the efficiency of the work of the rest of the staff. Reduce the time for the formation of documents to accompany the transaction - use the ready-made templates of documents in the "Simple Business" or create your own. Improve the quality of your employees' phone conversations - with the help of automatic call recording you can listen to any conversation with the client. Communicate with employees in any convenient way: free internal IP-telephony or telephone conference, SMS from the program, chat and multi-chat for communication with several employees, video call or videoconference, appointment of projects, tasks and cases. Register in the CRM-system "Prostoy Business" right now and improve the effectiveness of personnel management in your organization.